BJP President Amit Shah will on Wednesday hold a roadhshow as part of the ‘Karnataka Parivartan Yatra’ to expose the “poor governance” in the poll-bound southern state, upping the ante against the ruling Congress government. 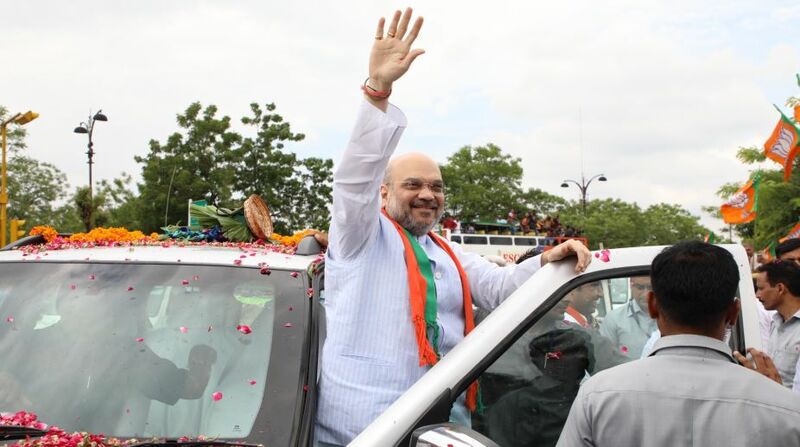 Shah will take part in a rally at Holalkere in Chitradurga district as part of the ongoing 79-day yatra that he flagged off on November 2, 2017. Over 10,000 party workers and supporters are expected to take part in the rally which aims to “create awareness on the failure of the state government” Bharatiya Janata Party (BJP) leaders said. The rally will culminate on January 28 with Prime Minister Narendra Modi’s address. Party’s chief ministerial candidate BS Yeddyurappa will also be present along with top party leadership. Shah, who arrived in the state on Tuesday evening held a strategy session with state unit leaders, party legislators, MPs, and office-bearers to prepare for the polls. According to reports, Shah gave a 23-point formula to strengthen its grassroots-level organisation through micro-management. The BJP is going all guns blazing to oust the Congress from the big state, which sends 20 or more MPs to the Lok Sabha. The 224-seat assembly is likely to go to polls in May and the BJP has set itself a target of 150 seats. The BJP is planning to launch a two-front attack on the incumbent Congress with Shah along with Uttar Pradesh Chief Minister Yogi Adityanath, who is actively campaigning in the state for weeks, consolidating Hindu votes while Modi, with a blitzkrieg of rallies in the last stage, will woo the urban voters. The Congress and the BJP had won 122 and 40 seats respectively in the last assembly polls.